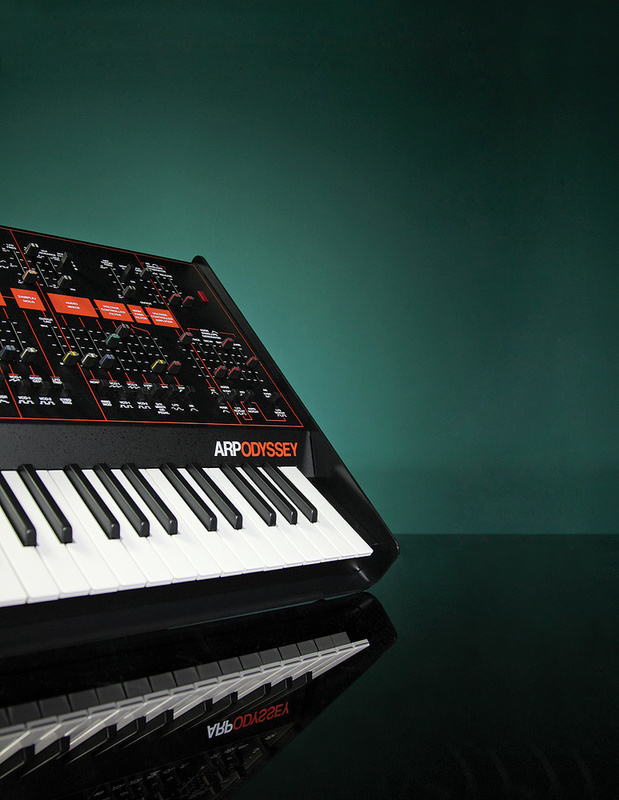 The Odyssey comes in an ARP–branded semi–hard case. So I did the only thing I could. 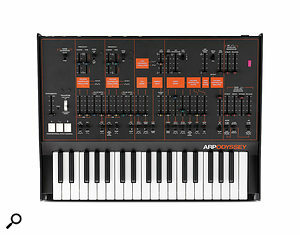 I took the MIDI Out of a full-sized synth and connected it to the MIDI In of the KARP. Joy! Bliss! Ecstasy! (In a legal way, of course.) 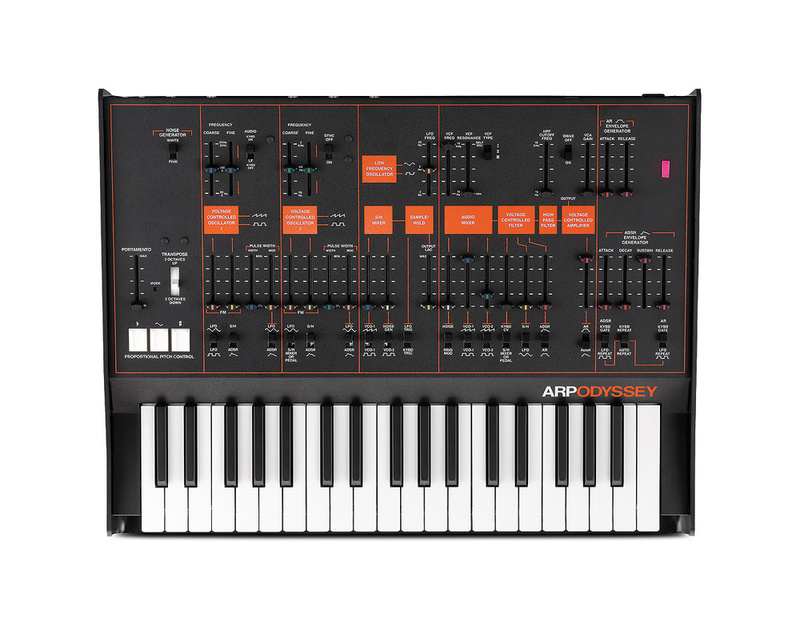 Five octaves of sheer early–’70s synthiness. What’s more, the KARP’s duophonic voice structure is still interpreted correctly over MIDI, with VCO1 remaining low-note priority, VCO2 remaining high-note priority, and everything between being ignored. That’s excellent. Unfortunately, the only two things that the KARP understands are MIDI Note On and MIDI Note Off. I didn’t expect velocity or aftertouch (which, of course, are not implemented on the KARP itself), but not even pitch–bend nor modulation are implemented, which seems a bit mean — and philosophically dubious — given that they could be routed to the same places as the outputs of the PPC. Likewise, the only data that the KARP can transmit via USB are Note On and Note Off messages. Not even the performance controls generate MIDI information. I suppose that, given what it’s able to receive, that’s not surprising, but it’s extremely disappointing because it means that you can’t sequence and replay performances that use anything more than just the keys. All your pitch–bends and vibrato from the PPC are lost. Again, whose daft idea was that? 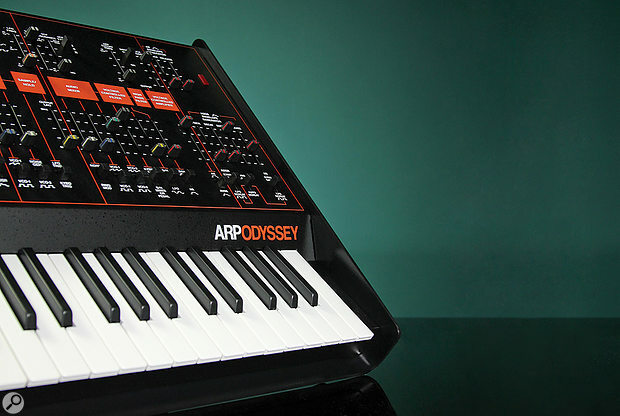 The sound: it really is an Odyssey. Smooth faders! The joy! The joy! Approximations of all three original filter characteristics in a single instrument. Additional overdrive and feedback options take it where no Odyssey has gone before. 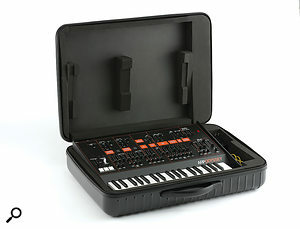 It’s supplied in an attractive carry case rather than a box, which is excellent. The size. Ask yourself: can you live with three inches less? The MIDI implementation is much more limited (and limiting) than you would expect. The PPC is as hard to use as it ever was. It uses a wall–wart PSU. It looks like an Odyssey. It sounds like an Odyssey. It has enhancements that make it even better than an Odyssey. But the diabolical Emperor Zorg has reduced it with his evil Shrink-o-matic ray so that you can’t play it like an Odyssey. Sometimes, the world just defies explanation. Available in a choice of colours: classic Black & Orange, White or Black & Gold.